Over the years we have converted models for testing of conversion development that have not been put into general production. This was either due to the cost for producing such a conversion or due to the lack of interest shown in a conversion for the model. We have listed these models below along with ones we have done for customer commissions just in case anyone may be interested in these models and have questions about them. All these conversions, unless otherwise specified, have had new wheels, Axles, Crank pins, Balance weights and Final drive gear fitted. Following the news that Mashima may close down, modellers have been looking for another motor similar to the ones produced by Mashima as a possible replacement. 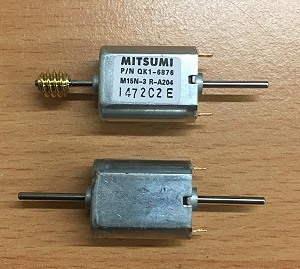 Currently one option is a Mitsumi motor, these motors we have been able to find with or without a brass worm fitted, like the ones shown in the photo opposite. This is a side project that Brian has been working on to see if it is practical and cost effective to produce our current range of wheels with cast brass centres, so they can be used on split chassis setups. Having seen the work carried out to the Bassett-Lowke motor bogie in the 'Workshop' section of our web site. We were asked if we could do the same repair work to a Bassett-Lowke chassis to replace the badly worn gears on this 80+ year old chassis. 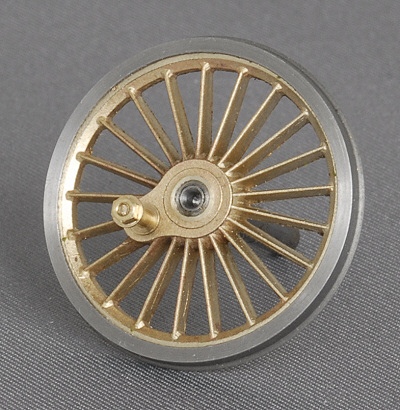 This wheel is suitable for the Class 43 (253/254) HST. As shown in the photo, we had looked at having brake discs on both the front and back of the wheels. However, due to the thickness of the material used to produce the brake discs. 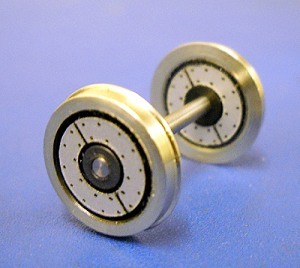 The back set, stand out from the back tyre face by around 0.010" (0.25mm). We did try increasing the recess in the back of the wheel but this just destabilised the wheel, so we are currenly thinking that only the front ones should be fitted. If there is enough interest in them, we hope to have these available in the new year as time allows for development work to be completed. We are also looking at a conversion for the latest version of the Hornby HST.